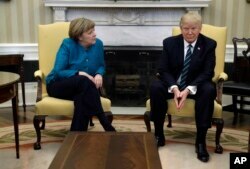 President Trump did not shake Angela Merkel's hand during this meeting in March. 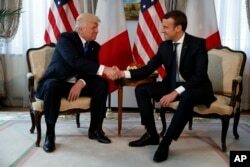 President Donald Trump shakes hands with French President Emmanuel Macron during a meeting in May. Macron called it "a moment of truth." 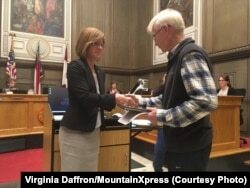 Asheville, North Carolina Mayor Esther Manheimer shakes hands with a local volunteer. 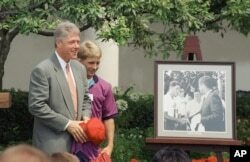 President Bill Clinton is presented a photograph of his meeting with President Kennedy in 1963 when he was member of Boys Nation. Dan Friedell wrote this story for VOA Learning English. Caty Weaver was the editor. Dorothy Gundy produced the VOA Learning English video. 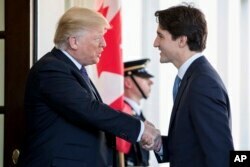 How would you describe your handshake? We want to know. Write to us in the Comments Section or on our Facebook page.